Armed response units / firearms units are teams of armed Police Officers tasked with countering crimes committed by armed criminals. Each UK constabulary / force has some form of firearms team. One of the nation's most prominent firearms units is the London Metropolitan Police Service's SCO19. Designation, organisation and equipment used by firearms units varies as each constabulary has its own budget, set by its Police Commissioner. Depending on constabulary, Police firearms units may be called the Tactical Firearms Unit, Firearms Support Unit, Specialist Armed Response Unit or Tactical Aid Group, among other names. AFO is the basic designation for a British police officer who has been trained in the use of firearms and has been authorised to carry them on duty. Level of training varies depending on role. Some AFOs may only be given a basic level of firearms training, i.e. core weapons skills, mostly defensive attacks. This is usually focused on the use of whichever model of self-loading pistol - e.g. Glock 17 - is their unit's standard. Police officers in units such as the Met's flying squad, for example, typically only carry a pistol. The types of role that an AFO may perform include Armed Response Vehicle (ARV) Officers, Specialist Firearms Officer (SFO), Close Protection Officer (CPO), Personal Protection Officer and Tactical Support Officer. There are two classifications of incident that an AFO may be brought in to deal with: spontaneous i.e. armed officers are called to the scene of an incident as it occurs / has just occurred, and authorised i.e. a pre-planned operation. ARV Officers respond to spontaneous firearms incidents. They typically carry out mobile patrols in vehicles such as the BMW X5, poised to deploy to an incident as needed. ARV AFOs will typically always have a self-loading pistol, such as the Glock 17, on their person. They will also have access to 'long arms', such as the H&K MP5SF and H&K G36C carbines, which are stored securely in the vehicle. Training includes advanced driving, performing stop and search of suspect vehicles and containment of a vehicle or building. 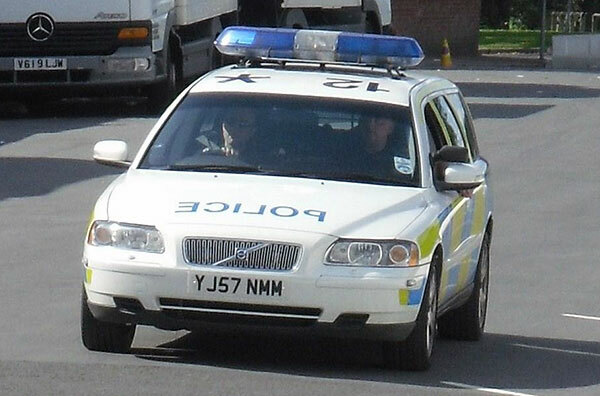 A North Yorkshire Police Volvo V70 Armed Response Vehicle (ARV). North Yorkshire Police AFOs are organised into the Firearms Support Unit (FSU). SFOs carry out pre-planned, intelligence-led, authorised operations against criminals suspected of being in possession of firearms. They are trained in dynamic entry ie use of battering rams and other tools to make entry into a building. They may also train in the use of stun grenades and tear gas. The SFO role requires a higher level of training than ARV Officers receive. SFOs will typically have served in the ARV role for several years before joining a SFO team. Photo - a member of a West Midlands Police armed response team dressed in the sort of tactical gear common to such units. Clothing includes overalls - usually manufactured from a fire-retardant material such as NOMEX, boots and gloves. Headwear is typically a kevlar helmet such as a MICH 2000 over a NOMEX balaclava, headset/ear defenders linked to a secure radio, and eye protection in the form of goggles. Body armour may be worn, including a kevlar vest / plate carrier holding ballistic armour. Kit carried includes handcuffs, first aid kit, secure radio, ammo pouches (main gun and pistol), stun grenades, CS tear gas grenades. Tools for making dynamic entry such as crowbars and sledgehammers may be carried. Aside from a primary and secondary weapon, a taser and pepper spray may be carried. Ballistic shields may be carried by the point man in a team. Rifle Officers are specially-trained AFOs who deploy as a Rifle Team (Rifle/Observer Team) in support of an authorised firearms operation. They may be armed with a 7.62mm x 51mm scoped bolt-action sniper rifle or semi-automatic rifle. They are trained to be able to make a precise shot, through glass barriers if necessary, This capability includes a simultaneous coordinated shot i.e. two Rifle Teams firing at the same time. Despite their skills with the rifle, a Rifle/Observer Team's function is typically more about gathering intelligence than it is about pulling the trigger. The most common firearms employed by British armed units are the Glock 17 9mm pistol, the Heckler and Koch (H&K) MP5SF 9mm (single fire) carbine and the H&K G36C (single fire) 5.56mm carbine. Walther P99 - carried by Nottinghamshire Police AFOs. M&P40 - pistol in .40S&W used by Greater Manchester Police Tactical Firearms Unit. Sig Pro 250 - 9mm pistol used by Essex Police. H&K MP5SF - 9mm carbine, single-fire version. H&K G36C - 5.56mm semi-automatic carbine. The G36C-SF and the MP5SF are the most commonly carried armed response unit carbines. LMT Defender - AR-15 clone carried by AFOs in the combined Cheshire / North Wales area. The Defender is also carried by British Transport Police (BTP) on patrols of railway stations and by their armed response unit. H&K HK53 - 5.56mm semi-auto carbine used by Cumbria Police and Glasgow Police. Sig SG516 - 5.56mm carbine used by SCO19 Tactical Support Teams and CTSFOs. Blaser 93 - German-made bolt-action rifle used by Avon & Somerset Police. H&K L104A12 37mm launcher, a 'riot gun' that fires an Attenuating Energy Projectile (AEP), otherwise known as a 'plastic bullet'. Fitted with L18A1/2 sight. X25 Taser - fires high voltage wires attached to darts in order to incapacitate the suspect.